From needs to solutions, the technology on display at last week’s IN(3D)USTRY event at Fira Barcelona kept the focus on today’s developing realities in industrial 3D printing. A very busy conference agenda featuring 55 experienced speakers over the three days of the event, IN(3D)USTRY was a part of Barcelona Industry Week 2017 which drew an estimated 50,000 together through co-located events focusing on 3D printing, chemicals, the Internet of Things (IoT), and more as technologies continue to drive the next Industrial Revolution. When it comes to advanced manufacturing, additive techniques are taking a great deal of focus in real-world (and out-of-this-world) applications. The first day of IN(3D)USTRY kept the focus on aeronautics and automotive verticals, and speakers touched on some interesting applications for additive manufacturing throughout the curated panel sessions, with a look at some of today’s benefits and challenges of incorporating 3D printing in their operations. During the discussion on aeronautics in a panel moderated by Thierry Rayna, speakers working with advanced 3D printing technologies for use off the ground touched on some of the history behind and a very few of the very many future implications of their usage of additive manufacturing. Angel Martinez, Physical Design Manager, Thales Alenia Space (TAS), discussed the processes of additive manufacturing; the heritage of their use at TAS; the company’s work toward a leadership position in additive manufacturing; and two philosophies of validation that come into play. In a bid to democratize additive manufacturing technology, TAS is working to get ahead of challenges including validation to best take advantage of the beneficial qualities of new technologies. Lighter-weight parts created in-situ and on-demand offer the flexibility of manufacturing that will truly drive developments in adaptable manufacturing for space. Martinez pointed as well to the use of both metallic and polymeric materials in use, including parts currently in orbit. Speaking for Aernnova, Miguel Angel Castillo, VP, Technical Development, touched as well on the merits of topology optimization and the benefits offered through creation of a best-fit part. “We are not constrained [with 3D printing] as we were in tooling parts. This can enable 30-40% weight reduction, add new functional enhancements, produce more highly integrated parts, and see ecosystem savings in terms of energy and raw materials,” he said. Additional presentations from the ITP, ESA, and Airbus spoke to similar themes of the growth in 3D printing. Such ambitions in technology for aerospace applications are becoming a more common refrain as the capabilities of 3D printing continue to develop, as the European Space Agency has recently filled us in on following this summer’s AM Conference in Nottingham. With a look toward keeping all four wheels on the ground, the panels on automotive applications for 3D printing were split into two: one for OEMs (original equipment manufacturers) and one for automotive tiers. During the OEM panel, representatives from SEAT, Renault, FCA (Fiat Chrysler Automobiles), and Local Motors shared a broad look at how additive manufacturing is coming into play in creating their automobiles, and why the technology is well suited for use in automotive production. Unsurprisingly, a major use here is in rapid prototyping, as these companies appreciate the quick turnaround times allowed for in new design made possible via 3D printing, which cuts out the middleman in model making. 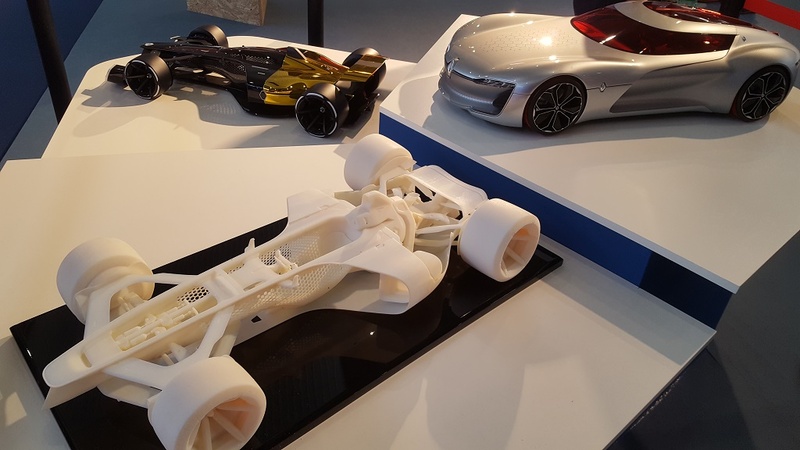 Renault’s Head of Design Innovation and Advanced Technologies Department, Melanie Barriere, noted that 3D printing has come into play for its ability to create precise details, mostly plastic though some in metal, used in the creation of concept cars. Renault mostly machines parts, but is seeing a rise in its adoption of additive manufacturing as well as the use of sand casting. Applications for 3D printing extend from R&D to the line-up, she noted. For prototyping, design for additive manufacturing (DfAM — including topology optimization), and innovation, FCA has been turning to 3D printing for years now, explained Head of Prototypes Nunzio di Bartolo and Head of Production Division Roberta Sampieri. Additive manufacturing has been in use in their prototyping operations since 1995, in testing since 2013, and use of DfAM benefits since 2016. Local Motors’ Marketing Director, Carlo Iacovini, highlighted another major benefit of additive manufacturing that especially appeals to his company: local production. Well known for its use of micro-factories, Local Motors counts this approach as one of its two foundational pillars, alongside co-creation. 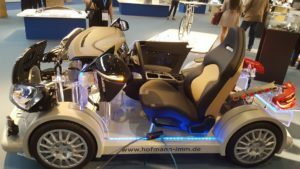 The adaptability of 3D printing for various vehicular architectures allows for personalized vehicles and a new take on transportation. While the new self-driving Olli vehicle is already seeing some use in communities, the smart vehicle is getting a facelift through a move toward being 3D printed — and, soon, toward becoming accessible, a new take which will be showcased at CES 2018. “We are targeting economies of scope, not economies of scale,” Iacovini noted of Local Motors’ objective. During the roundtable discussion moderated by CIAC‘s Vicenç Aguilera, the OEMs discussed their use of 3D printing — and many of the underscored benefits and challenges of adopting the technology aligned with what we had heard earlier in the day from the aerospace sector. As the conversation at IN(3D)USTRY was targeting real-world use cases, each presentation given kept a realistic point of view in highlighting not pie-in-the-sky high hopes for how 3D printing might be the saving grace of the future of manufacturing, but actual applications offering viable solutions. Through careful and repeated testing in growing everyday use, the companies using 3D printing technologies showcased advances in materials capabilities, precise geometries made possible, and economic benefits of using additive manufacturing. At the same time, each presenter noted the key areas holding back wider use and deeper adoption, as additive manufacturing has further development before it becomes a more total solution to a wider swath of issues. 3D printing offers the ability to design application-specific parts targeted for individual systems. While additive manufacturing is seeing rising use in, for example, satellite construction, no two satellites are the same, nor are their missions; a communications satellite has different needs from the International Space Station or from a handheld CubeSat, and each is constructed very differently despite similar overall needs. The ability to design for particular applications allows for optimized creations, which themselves benefit from topology optimization and simulation to ensure best-fit shapes and strong performance. Digital manufacturing enables simulation prior to physical production, through which stress tests and algorithms can be run to ensure appropriate performance and strength. Materials are a huge consideration in the production of terrestrial and aero vehicles in terms of both cost and weight. Particularly for metals, the materials going into the creation of automotive and aerospace components do not come cheap, and because additive manufacturing is a low- to no-waste production process putting down only the materials needed for a particular build, cost and materials savings are made possible. The geometries made possible via DfAM additionally allow for the creation of optimized shapes that cut out structurally unnecessary areas of a design. Time savings in 3D printing comes in the form of the ability to bring prototyping and other processes in-house, speeding turnaround of iterations. As automotive OEMs seek to bring the latest models to market at a rate keeping up with customer demand, timing is often of the essence during design. As we have seen, bringing 3D printers into the production line to create customized tooling additionally speeds production time, and allows for the local creation of replacement parts. 3D printing isn’t there yet, in many areas of consideration, to be a total solution. Of course, additive manufacturing will likely never be the only form of manufacturing in industry, as hybrid and complementary technologies will continue to work together to find the best solutions for production. Still, additive technologies do have a ways to develop before they can take their place more fully in more operations and see more mainstream adoption. Overall, there is absolutely room for growth in additive manufacturing adoption into the aerospace and automotive industries — and much of this growth will come on the heels of advances addressing current limitations.